Last year I published a PowerShell script to download the MMS sessions. It has been such a great success that I got a lot of nice responses. 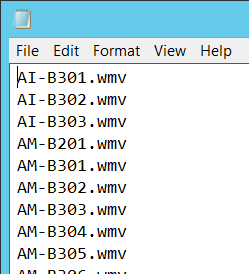 Therefore I made just small changes and it will work for the MMS 2013 also since they are published on channel 9. But as we are used to in IT there are always enhancements included. Stefan Stranger has a great PowerShell script created to download the session catalog into Excel. You can find his blog post here. Because I wanted to create the session file, which contains the sessions to download dynamically, I created another script. I adapted the script from Stefan Stranger script to generate the sessions.txt file which is used by the downloader script as input file for actually downloading the session files. This way you can create the file over and over again in case the sessions change or whatsoever. First download both scripts from Skydrive here and copy it into the same folder. If you run the script Create-MMS2013SessionFile.ps1 the sessions.txt file will be saved in the same directory as the script itself. If you start the MMS2013_Downloader.ps1 you will be prompted to choose a path where you want to save your video file. Note: I could not test the scripts thoroughly because not all sessions are yet online and of course I wanted to deliver it as fast as possible. If you experience any errors, let me know. I hope this helps and you get your videos ready for the flight home. Enjoy! and then you can run the same file again without special action for already downloaded files. Thanks Again! Might want to mention in the post that requires Powershell 3.0. Quick and easy. Any idea what the total size of the downloaded files is? One session has an average size of ~200 MB. So the total size of all sessions would be around 50 GB. Awesome stuff. Is it possible to include the session name in the Session file so that it’s easy to identify? In addition adding the session name to the video files would be excellent. Someone has a bit extended my script which might fits your needs, see here http://myitforum.com/myitforumwp/2013/04/16/downloading-mms2013-content-with-powershell/ . I have modified and your script to handle the Lync Conference 2013. It appears that the URL is no longer working, has anyone found a modified URL? Which URL does not work? It appears the value for take no longer accepts “-1” as a value. If you change the URL to take=500, it should download everything just fine. So I am counting 213 videos not available … is that about right, and does any one know why?